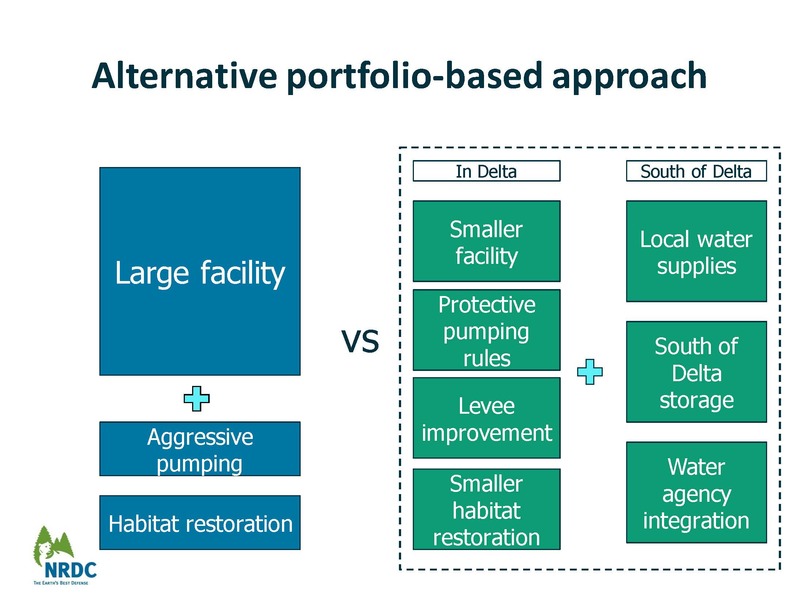 “What’s next for the Delta? 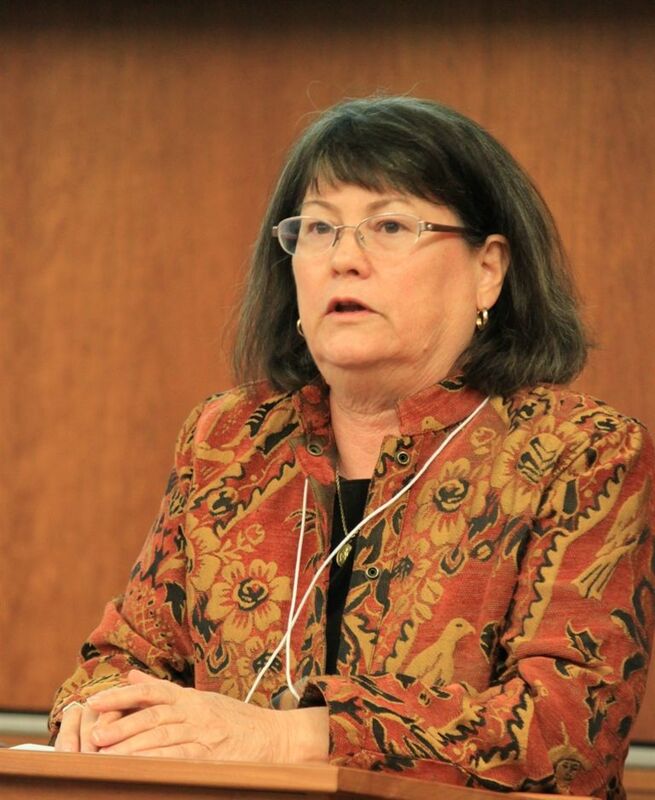 ‘Enquiring minds want to know,’” began Martha Davis, moderator for the closing plenary session of the Planning and Conservation League’s 2014 Symposium: Water for Life: Towards and Equitable and Sustainable Water Future for California. On the panel are Paul Helliker, Deputy Director with the Department of Water Resources; Doug Obegi, Staff Attorney with NRDC; Jonas Minton, Water Policy Advisor for the Planning & Conservation League; and Don Nottoli, five-term Sacramento County Supervisor. Each of the panelists began by giving a short presentation. Aquatic species have been declining over time, he explained, noting that they did pickup in the mid 2000s but the drought in 2007-08-09 had a major impact on populations. “So with that, what do we do to try and resolve that problem, given all of the various factors that cause problems for the species,” he said. 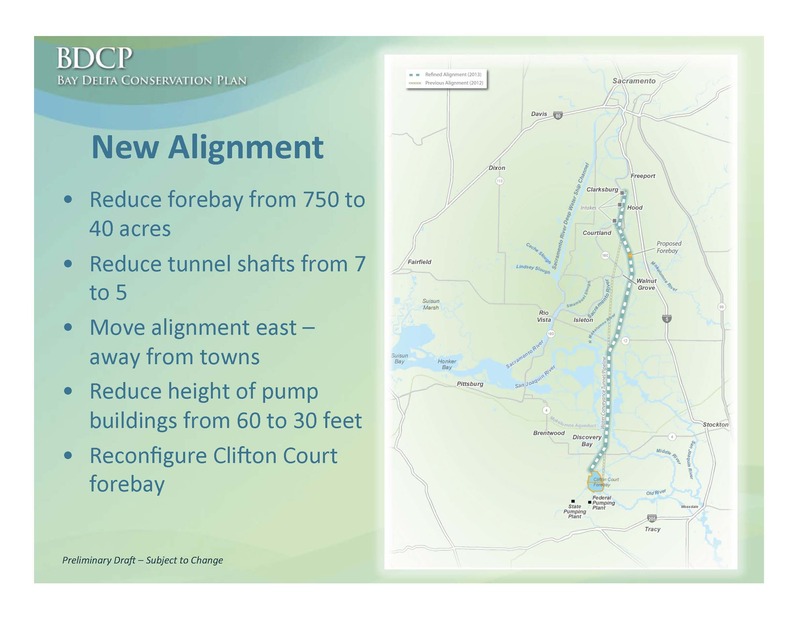 “One solution that we’ve proposed, one of many things that we want to do on water systems throughout the state, but specifically with respect to the Delta, something that Chuck Bonham, the DFW Director says has been on their departments priority list since the 1960s is to change the way that we run water through the Delta. 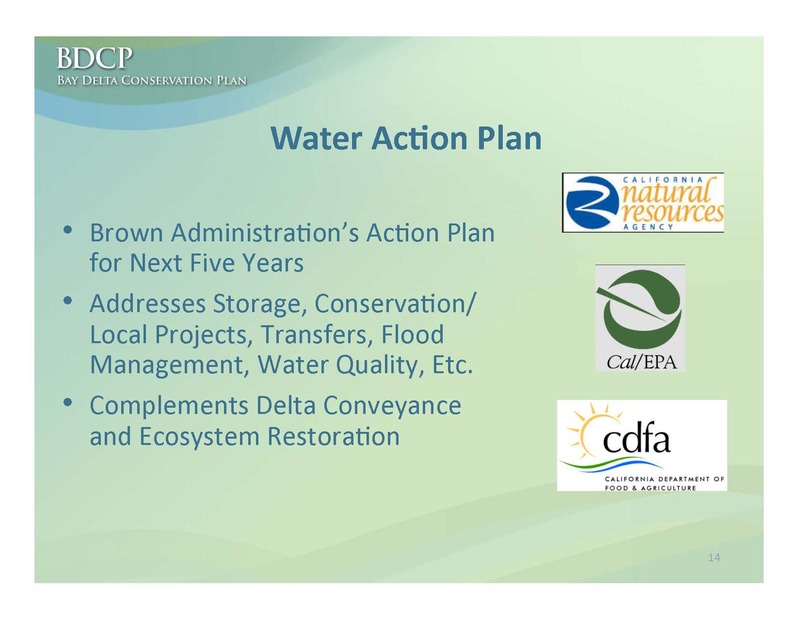 What we have is a conservation plan proposed under the state and federal endangered species acts, and a permit request to build a conveyance facility, to change or add a point of diversion for water that would be delivered from the Delta to the north end of the Delta for a variety of reasons, to benefit the species in the Delta, and then coupled with that, significant habitat restoration to reverse what happened over the past 50 years of changing wetland habitat to agricultural habitat in the Delta and the consequences associated with that.” He noted that the plan proposes 100,000 acres of direct conversion of properties purchased from willing sellers and another 45,000 acres of farmland protected under easements for habitat values. Out of the 100,000 acres of habitat proposed, 65,000 would be tidal habitat and 10,000 would be floodplain habitat, he said. “We had an experiment last year that showed that we can have some pretty significant benefits for salmon rearing by flooding floodplains and allowing the salmon to rear on a flooded floodplain rather than in the main stem of the channels in the Delta, so we know that that’s going to work, we just need to do it on a larger scale,” he said. 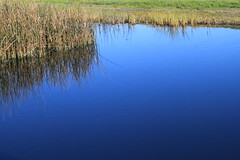 On Friday, the Governor released the California Water Action Plan, he said. 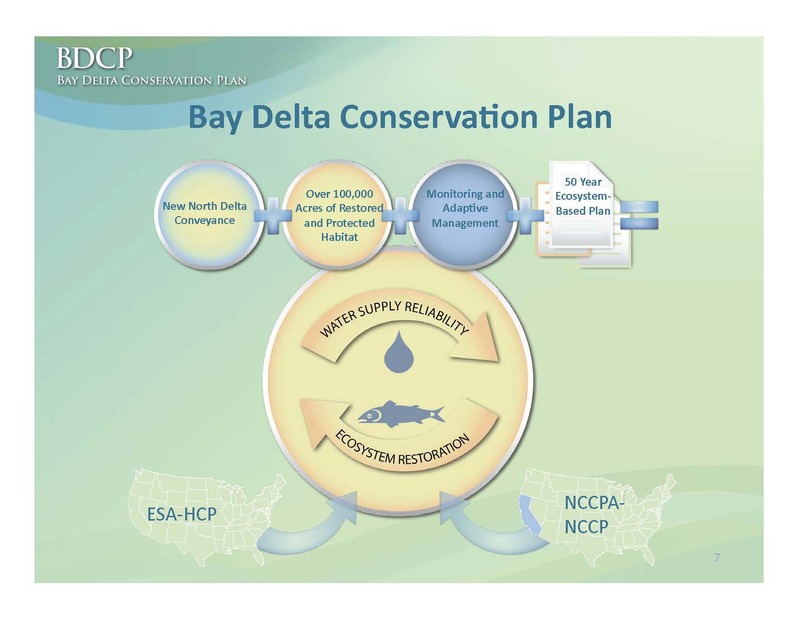 “The Governor has announced what he wants to do for the next five years, and it’s a fairly ambitious agenda that includes a whole host of things that people have asked us to include in the BDCP, but since the BDCP is only a permit request under the Endangered Species Act, it’s really not appropriate or possible to include these things,” said Mr. Helliker, noting that the plan includes local projects, conservation, additional storage, we’re also looking at groundwater, the water board has a proposed policy there, flood management, water quality benefits and so on, and so this is to complement what we’re doing with the BDCP. In terms of reliability, there’s no question that having the new intake will increase flexibility, he said. 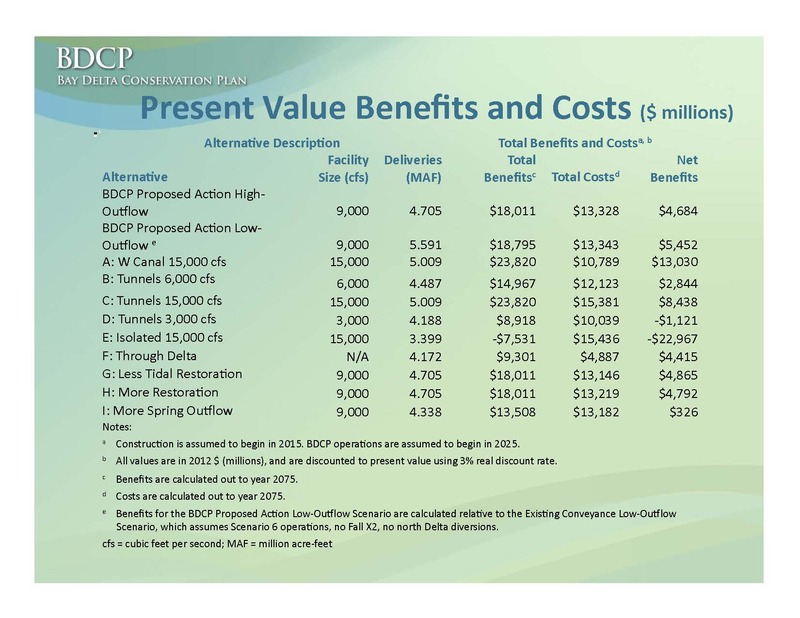 “But even with that large 9000 cfs facility, you’re still taking half of your water from the existing pumps, and in the dry years, when you’re really concerned about levee failures, you’re taking 2/3rds of it from the existing pumps, so investing in levees is obviously going to have to be something we have to continue doing, and paying to do so is a cost that we have to figure out how to pay for.” He noted that there were also concerns about whether a tunnel is actually more seismically safe. For Southern California, every billion dollars spent in the Delta creates jobs in the Delta, but it doesn’t create jobs in the local community, whereas investing in water recycling, conservation, stormwater capture, creates jobs in your community, creates water in your community, and creates local green infrastructure, local parks, particularly in places like LA that are so park-starved, he said. 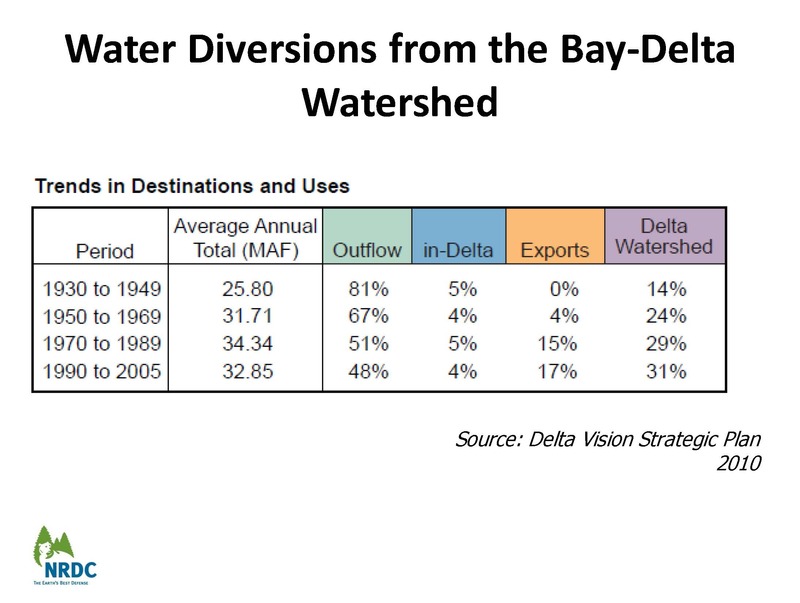 “That was an interesting thought, so shortly thereafter, a few other people also said that’s an interesting question, so CSAC gave us their conference room, and we invited everybody in to see if maybe there are three or four projects that we could actually agree on in the Delta. Just put it out there. DWR was very kind to find a mediator for about $35,000 and we brought people together,” said Mr. Minton. “The last lesson I have out of this which is most important and probably the hardest for me was to ask people rather than telling people – Asking them, involving them,” he said, noting that when he’s talked to people who have succeeded at projects, they have listened, they’ve heard, and had that kind of iterative process. “These other issues are going to go on and they have to go on, and I appreciate that those processes are important, but I’m glad that before I retire, a whole bunch of these projects are going to get built,” concluded Mr. Minton. “We’re going to be challenged in this drought year and so going forward, we look forward to working with the folks and hopefully we can find solutions that will hopefully be cost effective and ones that will have lasting impact on our ability to manage our water in way that is smart but also provides benefits to the environment and certainly the people, not only in the Delta but the state of California,” concluded Mr. Nottoli. “I think it’s hard to predict how people are going to respond to the drought, in part because this could be the last year of the drought, or this could be the first year of the next ten years, like Australia. And that is one of the real difficulties about drought is that it is unfolding in slow motion and you never know when it’s over until you can look back on it. I agree with Paul that one of the big differences we’ve seen from this drought 77-78 is that we are much more resilient, or 87-92, because we’ve invested in conservation and local storage and water recycling and we have these huge opportunities to do a lot more. 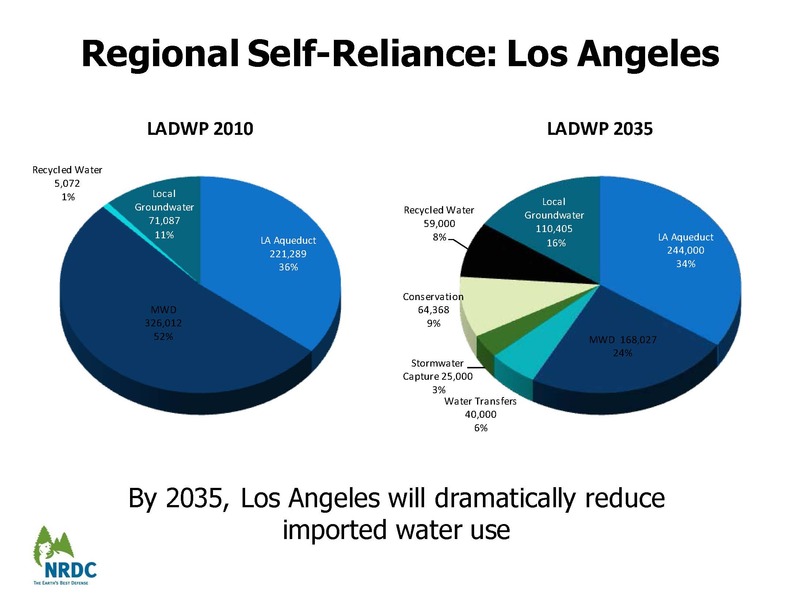 … I think there is a growing consensus, particularly as people around the state see that Southern California is the one part of the state that is not imposing mandatory rationing because of these prior investments. 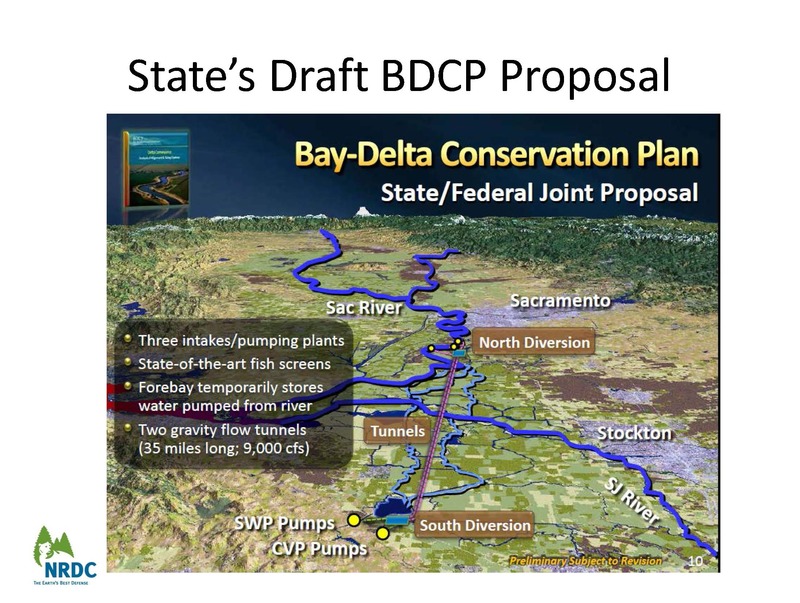 In 2011, I was in federal court arguing over protections for salmon and Delta smelt with the Bureau of Reclamation and DWR had to come up to the judge and say you know what, we’ve stopped pumping entirely because there’s no place to put water. We’ve completely filled every reservoir and for the first time that I know of, we actually turned off the pumps entirely. They never get turned off under the biological opinions but there was no place to put water. So I think that’s changed our perspective on the idea that local storage is important. 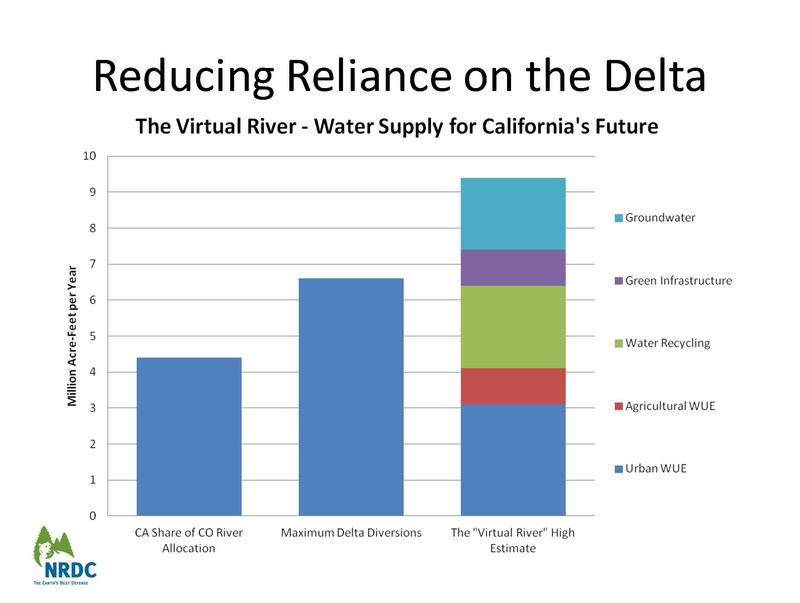 I think north of the Delta storage, big new reservoirs – that’s always going to be environmentally contentious. 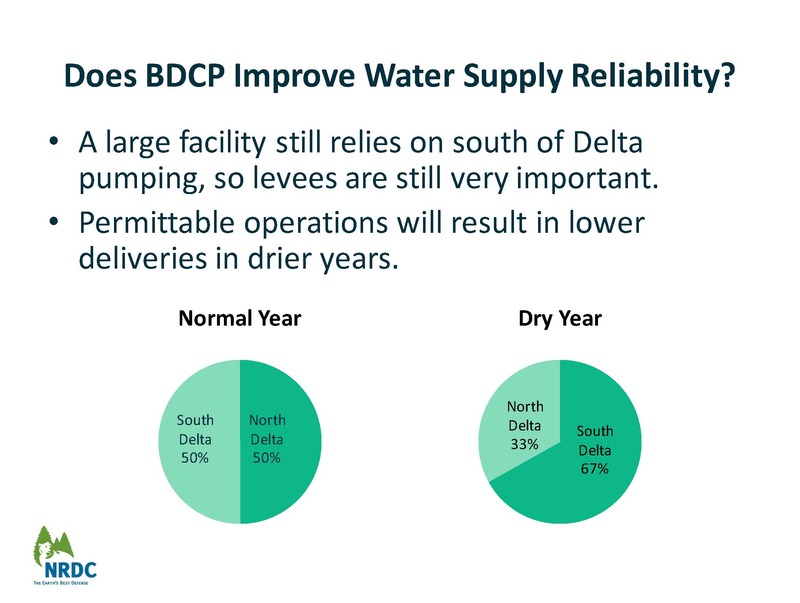 But south of Delta storage so you can take more in wet years – we took record amounts in 2011, more than we ever have before, there’s a possibility to take more in a safe way in really wet years. But that has to be paired with taking less in dry in that big gulp, little sip. “Here’s my prediction for 2014. People are going to scramble. It’s real time adaptive management on an almost hourly basis. Do you open those cross channel gates or do you close them? Does anybody see some fish coming? It’s almost like that. What’s the governor said about it? Here’s what he said. 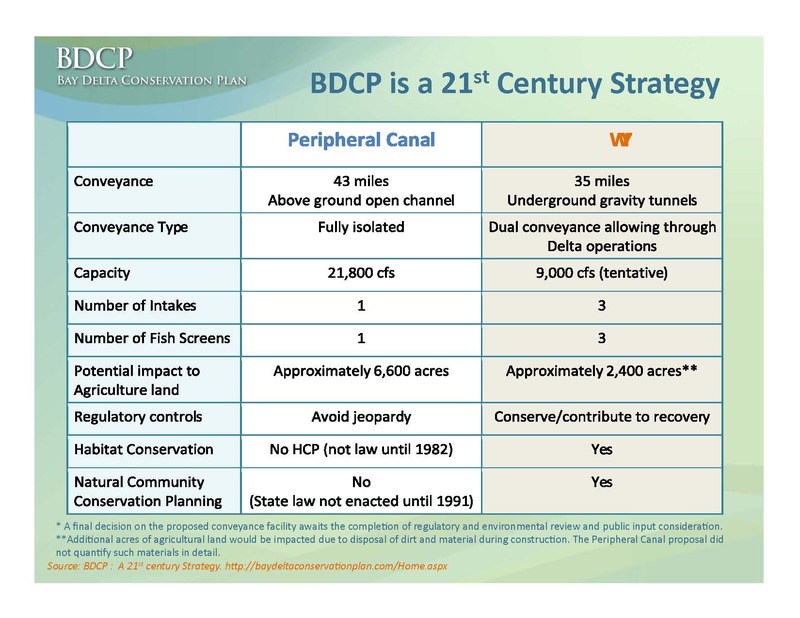 Well we hope in 2014 we’ll make some progress on BDCP. That was his statement in the state of the state speech. He doesn’t want to get too involved in it this year so it’s going to simmer, just going to be up there bubbling and there’s a time period for comments that may be extended and so forth. What’s interesting to me is not 2014 but 2015. Already one of the things that they are focused on quite rightfully is what do you do with carryover storage if you have any at all for next year? What do you do with fall run salmon which will be an immediate issue, what do you with the other fish species, and what do you do for water supplies next year? I do disagree that I don’t think this is an urban issue. I don’t think it’s the urban drivers as Doug said. Cities are learning to get by with less and they will continue to do so. The untapped resources are more than enough to accommodate their population increase. It’s about ag, folks. And that’s where it gets interesting in 2015. 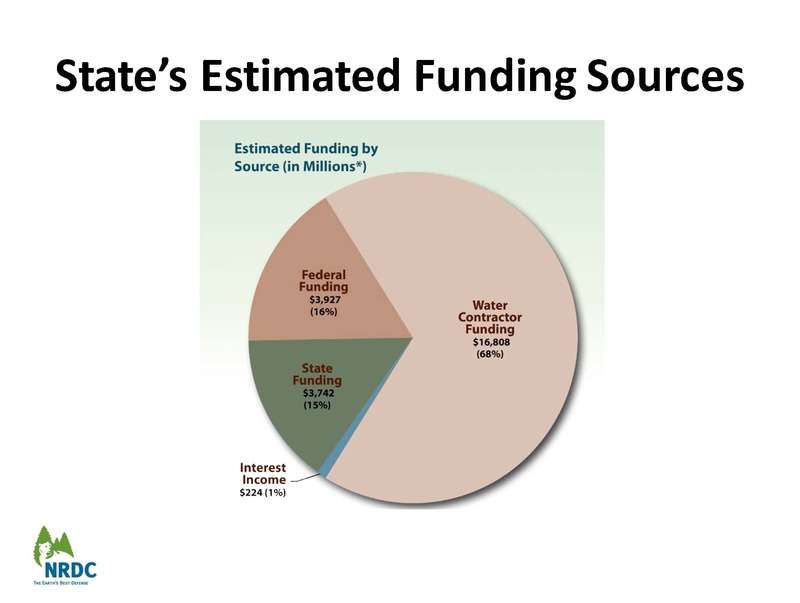 If it stays dry, you go with a 0 allocation, they are going to try and draw on groundwater aquifers that are sinking literally beneath their feet. 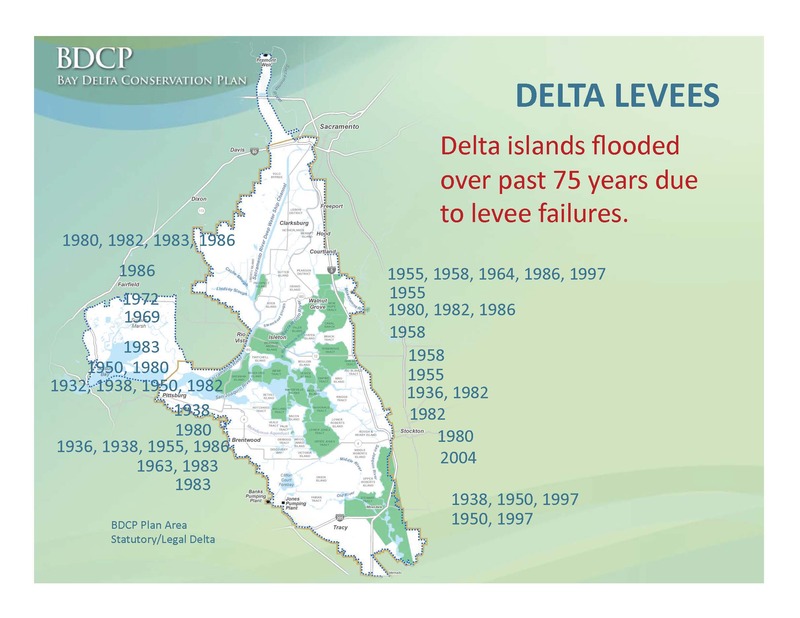 They talk about subsidence of Delta levees, how about the subsidence in the Central Valley already affecting some of the canals and distribution systems, so what does the private sector, what do the ags do if next year is dry. What does that do to the balance and is that the time when we really start thinking about do we have an agriculture that needs those quantities of water in the driest years to maintain their investments or do we go in other directions. Audience question: Paul, I’d be interested in your thoughts about the portfolio alternative … it seems there is a certain resistance within DWR to really explore broad alternatives to projects. I’d appreciate your comments on why the EIR didn’t really deal with the portfolio approach as an alternative. Click here to watch this panel discussion on YouTube. 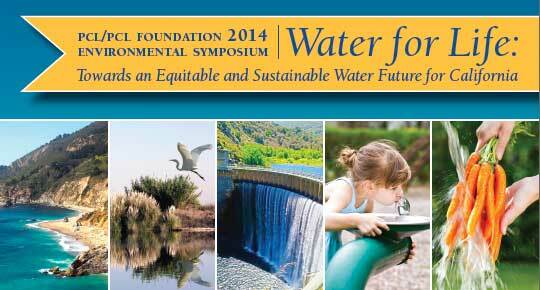 Click here for more information on the Planning and Conservation League’s 2014 Symposium.